The designers of the Think chair set out to develop a task chair which would be intelligent enough to understand how you sit, and smart enough to adjust itself intuitively. Everything about the this chair, from the soft, supportive upholstery and/or mesh, to the seat and back flexors, flexible front seat edge and the incredibly adjustable arms combine to make the most intuitive chair on the market. You don’t have to “think” about adjusting your chair because it does all the thinking for you. 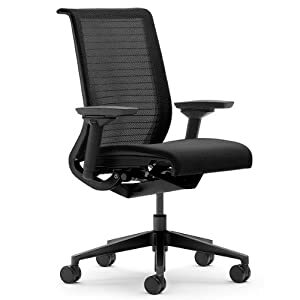 Order now and receive 23% off Think Chair by Steelcase – Adjustable Arms.